A 1923 map of Asia by Denoyer Geppert Co. of Chicago, for example, is unexceptional, but its depiction of the Arabian Peninsula is intriguing (see the detail posted to the left). 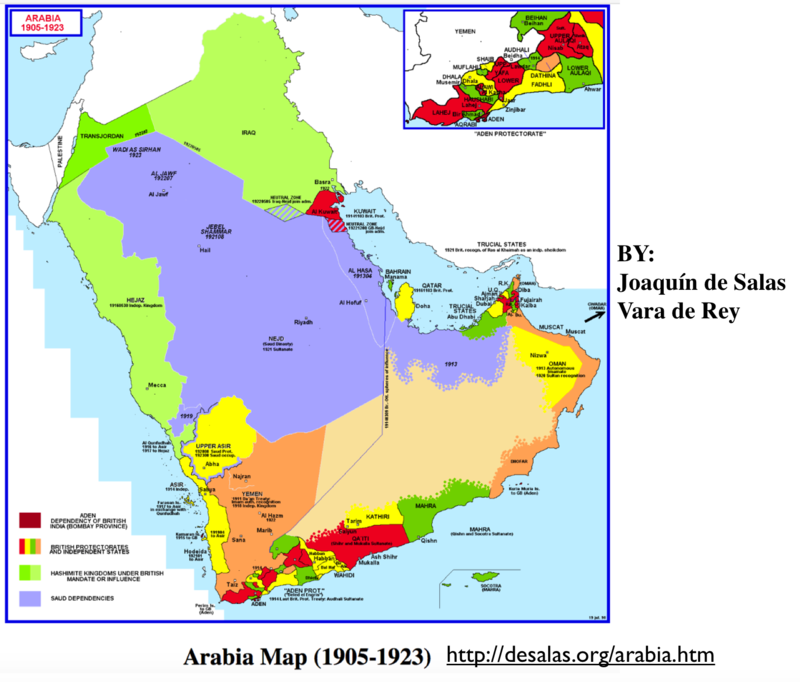 It shows, for example, the small, independent state of Asir in the southwest, rarely seen on maps of this sort, as well as the short-lived (1916-1925) Kingdom of Hejaz. 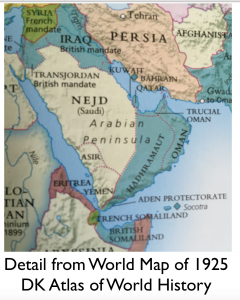 It oddly portrays Oman as if it were a sovereign state rather than a British protectorate, and more oddly still classifies both Qatar (somewhat distorted on the map) and what is now the UAE (then the “Trucial States,” another British protectorate) as parts of the Omani polity. 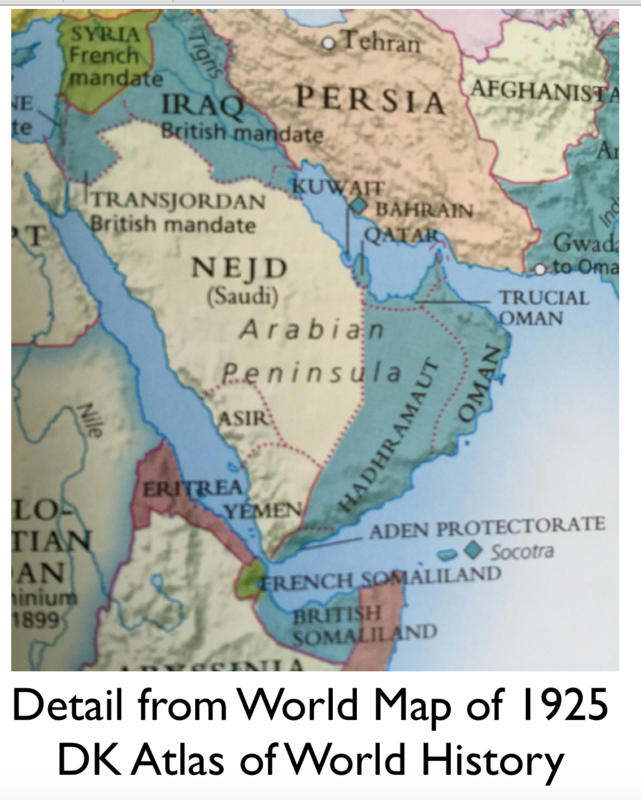 The most unusual feature is the pink strip of land—color-coded as British territory—just to the southwest of Qatar, in an area that now belongs to Saudi Arabia. 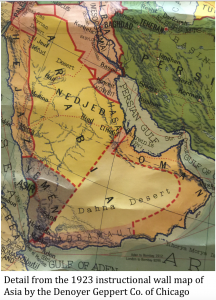 The mapping makes it seem as if this slice of land had been a northern extension of the British colonial sphere in southwestern Arabia (Aden and the Hadhrahmaut). Despite such odd and incorrect portrayals, I rather like this map of the Arabian Peninsular, as it reminds me of the recent establishment of the region’s geopolitical framework. When I was a child, I was intrigued by the undefined boundaries in the Empty Quarter (Rub’ al Khali; “Dahna Desert” on the map here), and even more so by the existence of the stateless Saudi-Iraqi and Saudi-Kuwaiti “neutral zones.” Later on, I was slightly disappointed to see the boundaries fixed and the neutral zones partitioned into nonexistence. Hejaz is the most cosmopolitan region in the Arabian Peninsula. People of Hejaz have the most strongly articulated identity of any regional grouping in Saudi Arabia. Their place of origin alienates them from the Saudi state, which invokes different narratives of the history of the Arabian Peninsula. Thus, Hejazis experienced tensions with people of Najd. Saudi Arabia is actually the world’s last great conquest empires, one formed in the unsettled environment that emerged with the destruction of the Ottoman Empire. It is such a recent entity that it net even fully figured out the problem of royal succession, and it still faces an unsustainable dynamic in the ever-increasing size of the House of Saud. In political terms, it is something of an anachronism, a pre-modern, absolute monarchy whose very name denotes the possession of territory by a family. (This would be like the UK styling itself “Windsorian Britannia.”). 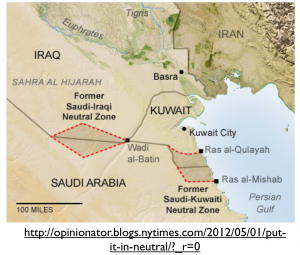 Given such conditions, “Saudi” national unity remains insecure, and the country faces the possibility of unraveling along regional lines in the event of a profound political or economic crisis. 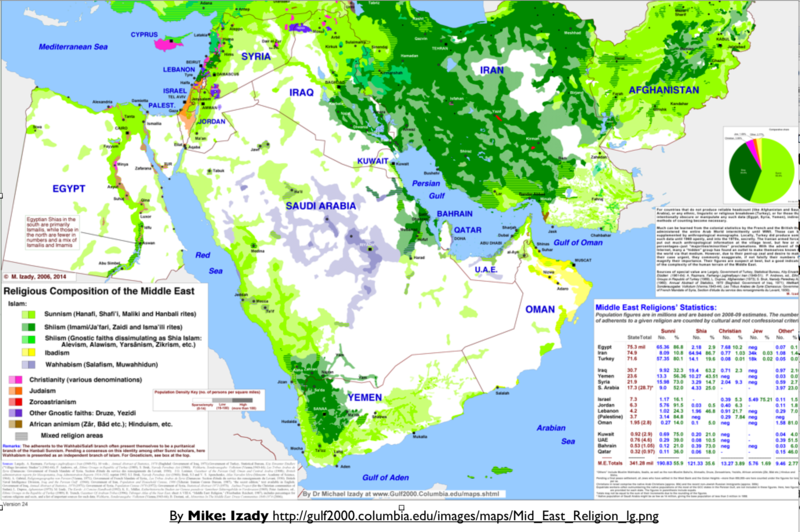 As Mike Izady’s map of religion in the Middle East shows, the Wahhabi sect on which Saudi Arabia rests is deeply rooted only in the central portion of the country, and is largely foreign to the economically vital Gulf and Hejaz regions. The recent and imperial nature of the Saudi state is rarely discussed, just as the country’s diversity of Islamic sects is generally ignored. 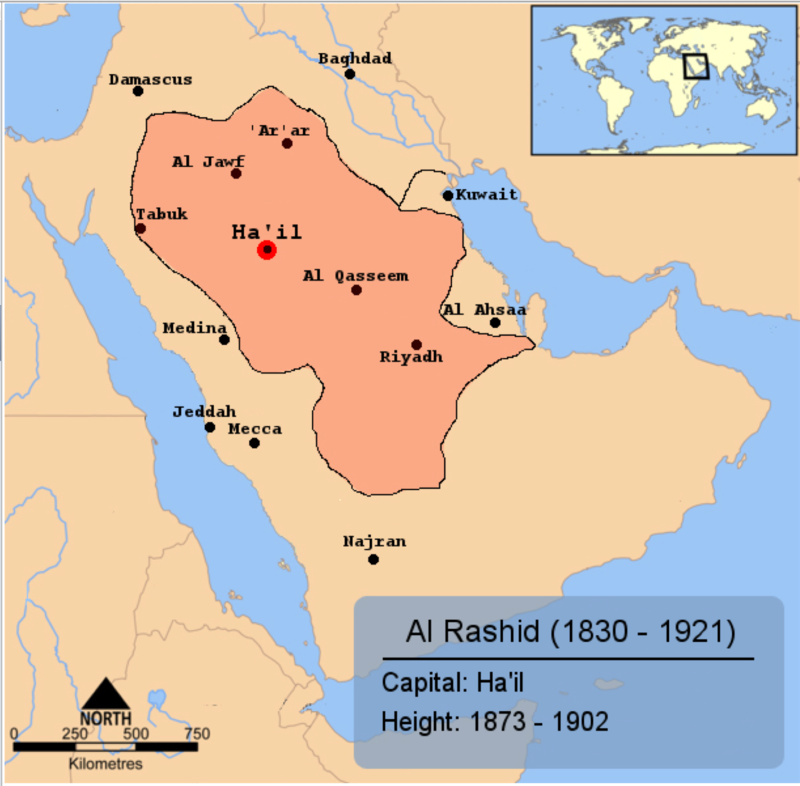 Articles on Saudi Arabia’s bombing campaign against the Zaidi Shia (Houthi) rebels in Yemen, for example, almost never mention the significant fact that most of the people in the neighboring highland region of southwestern Saudi Arabia are also Zaidi Shias (Those of neighboring Najran Region, on the other hand, are mostly Ismaili Shias.) Such historical amnesia is found the very title of the Wikipedia article on the creation of the Saudi state, “The Unification of Saudi Arabia,” which implies that the various conquered regions had some kind of preexisting and widely recognized unity that gives coherence to the current-day country. 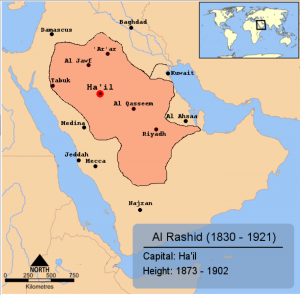 If the Rashīdis of Haʾil or the Hashemites of Hejaz had prevailed over the House of Saud, world history would probably have taken a markedly different course from the one that led to the world of today. Speculating on how things might have developed, however, is futile exercise. But the main point remains: there was nothing inevitable about the 20th-century emergence of a state encompassing the area that now forms Saudi Arabia, much less of a state that has the religious-political complexion of the current Saudi polity. 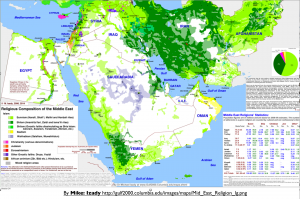 The same argument can be made in regard to the other contemporary countries of the Arabian Peninsula, most of which have shallow roots, at least in their current territorial configurations. Conventional historical maps of the early 20th century that depict a just a few British protectorates conceal the intricacy of the preexisting geopolitical order, one that could have yielded very different modern geopolitical formations. 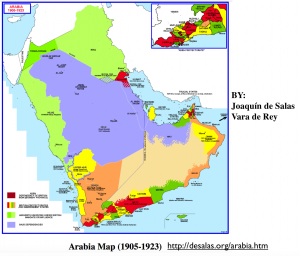 Compare for example, the standard map of Arabia in 1925 found in my favorite world historical atlas, the DK Atlas of World History, with the extraordinarily detailed map of Arabia 1905-1923 made by Joaquín de Salas Vara de Rey. The latter map may seem to be overly elaborate, but as Yemen continues to implode, it may end up having more relevance for the future than we might imagine. 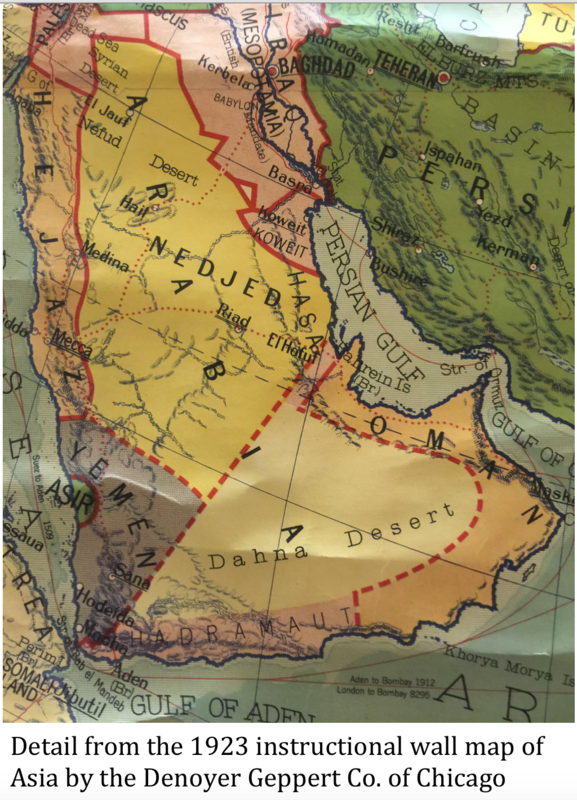 The next GeoCurrents post will examine two fascinating south Arabian political entities that did not make it onto the modern map: Mahra and Dhofar.